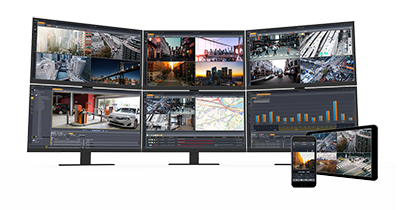 The combination of victor and VideoEdge maximizes smart streaming resources to optimize operation of high-resolution cameras and robust analytics while providing more efficient bandwidth management. In addition to the transcoding options, by accepting triple video streams from the camera to the NVR, victor and VideoEdge allow for more effective video management software operation in this bandwidth intensive environment. Operators can both listen and speak to individuals near a camera for improved situational response and control with new bi-directional audio support. The victor VMS streamlines user creation and privilege assignment with the union of roles between victor and the C•CURE 9000 security and event management platform from Software House. A single log/journal for both access control and video events saves investigation time by providing a single point of information for accessing alarm-related video and tools in intuitive, pre-defined layouts. Key system status indicators are clearly and visually displayed in a single graph form ensuring that operators have instant access to the most important system health information. victor and VideoEdge also offers powerful command and control to seamlessly synchronize video surveillance with access control, fire, intrusion and other systems into one powerful, intuitive interface and recording platform, allowing customers to manage their business more safely and intelligently.